Quite simply the must-have .NET decompiler for everyone. Now 10 times faster than the leading commercial decompiler. JustDecompile makes it easy to recover lost source code or peer into assemblies to discover the root cause of an external bug. Integrates with the powerful Visual Studio add-in, JustCode, for inline decompilation. Free for everyone, forever. When tested against the leading competitors, for .NET framework decompilation time, JustDecompile came out 10 times faster than the leading paid decompiler. JustDecompile quickly loads the core framework assemblies for .NET 2, .NET 3.5, .NET 4, .NET 4.5, WinRT Metadata and Silverlight. So loading the assemblies you want to browse is simple. JustDecompile’s robust search method, quickly pinpoints problems. With the addition of Full Text Search, the search is even more comprehensive. 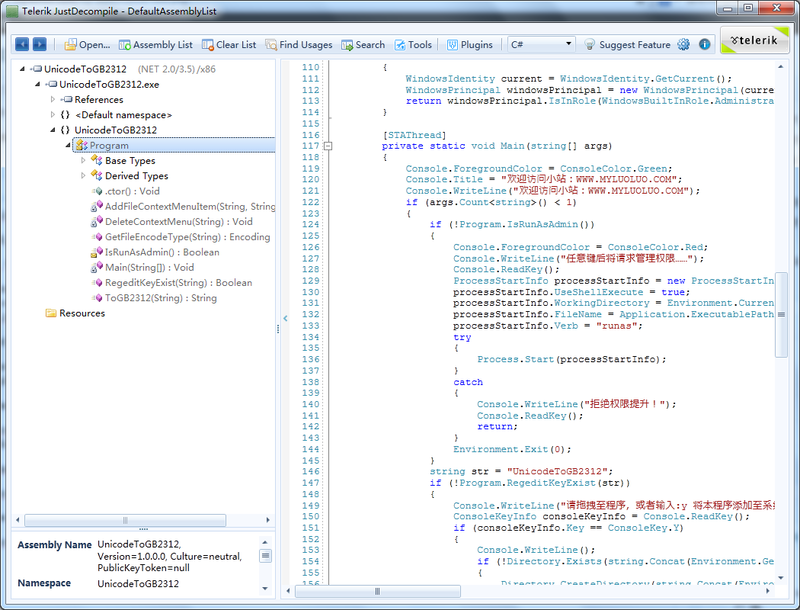 JustDecompile can create a Visual Studio project from a decompiled assembly. So you’ll never lose another project.